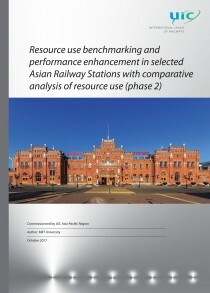 The research, being the second phase of the previously made by TER IInstitute study of resource use at selected Asian stations, has developed the results at the example of selected Russian stations and terminals. Besides the detailed examples of the use of technology at the stations of Anapaand Samara, the study was atentative attempt to summarize some approaches to there source use and energy saving, and to classify them. Besides, the research made a conclusion on the close interconnection between there source use aspects and the newly implemented concept of smartstation, underlining the links between digitalization process, environmental issues and enhancement of resource use efficiency in operation of railstations and terminals. The study particularly underlined the importance of system solutions regarding resource saving for different rail operations (client focused operation of the stations and transportation process, necessity to develop complex plans of resource management at stations). Some tools fo rconducting resource focused surveys at railstations were developed and suggested as well.